"Window Layout Resizer" extension offers easy window resizing tool in a toolbar popup format. 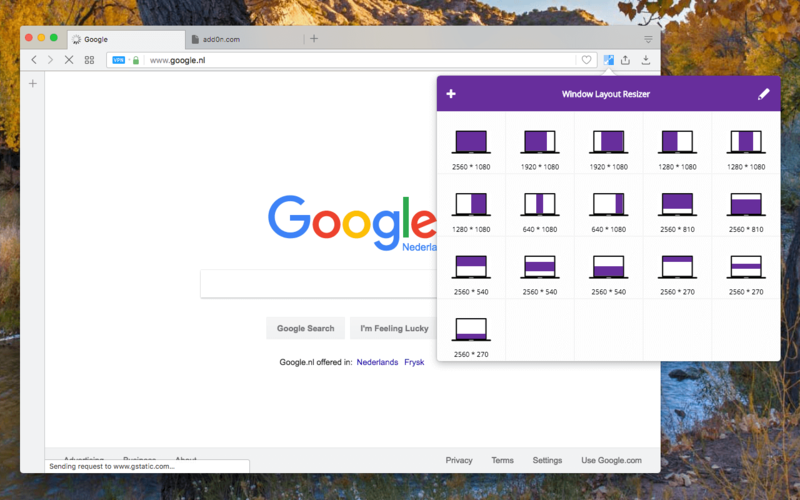 By default, most of the commonly used window layout sizes are offered. You can, however, add any custom layout from the options page of the extension. This extension is mostly useful to split the screen into several different areas and place each window in one of these sections. Note that this extension stores percentage of the occupancy and hence is working properly on different monitor sizes. Also, it supports multiple displays connected to a single computer very well. What is "Window Layout Resizer" extension and how does it work? After installation, you will get a popup window when the toolbar button is pressed. You can see several window layout sizes offered by default. Pressing each monitor icon resizes current window to the dimensions that are displayed in the picture. By default, most of the useful dimensions like half split or third split are supported. If you want anything else, just press the "+" button and define a new layout size in the newly opened window. This extension can be used to align multiple windows in a single monitor the easy way. For instance, you can have your editor in the half right side of the monitor and the browser window in the half left side for easy coding! How can I add a new custom window layout size to the panel? Open the toolbar panel and press the "+" button. You will be directed to a new settings page. Hold your mouse down in the monitor area and drag until the proper size is formed. Now press the save button. If you want to start over just press the mouse button one more time inside the monitor area and drag. There are too many default layout sizes in the popup. Can I delete a few to declutter the UI? Yes! there is an edit button in the popup. Pressing the button changes the state to the customization mode. You will get a trash icon on top of each item. Press the trash to permanently delete an item. Can I rearrange the default layout? I prefer to have my own custom layout sizes first. Sure, just drag the one that you prefer first to the location you want to. That's it. Also, note that you can have void spaces in the layout as well. For instance, you can delete all the existing layout sizes and keep only quarter layouts and place them in the four corners! When I am trying to add a new layout, I get this error message: "Error: you have reached the maximum allowed customizations". What is the meaning of this error and how can I fix it? To prevent too much cluttering of the popup, the extension only allows you to have a maximum of 20 different layout sizes. If you want to create a new layout when you already have these 20 layouts, you will get the error message. Simply delete an unused layout from the popup window and retry.